Local anesthetic agent is useful in providing local anesthesia while performing minor surgical procedure. In this case, the sensation need to be blocked in a localized areas of the body. Local anesthetic agent is also useful in providing spinal anesthesia. Consciousness will remain intact throughout the whole local anesthesia procedure. Local anesthetic agent will acts by decreasing the activation of the neuronal cell membrane by blocking the entry of sodium ion into the sodium channel. The blockage of the nerve may occur more rapidly in myelinated small diameter nerve fiber. Local anesthetic agent should remain in the localized area to provide an effective nerve block. This can be achieved by administrating epinephrine which is a vasoconstrictor. Epinephrine will reduce the rate of absorption of local anesthetic agent. There are two form of local anesthetic agent which are esther and amides. Esther tends to have more shorter duration of action in comparison with amide. 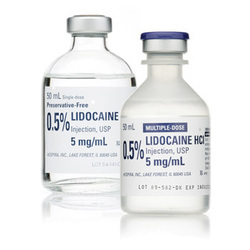 Amides form of local anesthetic agent may include lidocaine and bupivicaine. Esther forms of local anesthetic agent may include procaine, benzocaine and tetracaine as well as cocaine. The common sides of local anesthetic agent may include, hypertension and cardiac arrhythmias ( cocaine), myocardial depression, neurotoxicity, hypotension ( bupivicaine) and seizures.